Nokia announced Nokia XL phone at Estimated Price in India: Rs. 9300. Nokia XL runs on Android OS v4.1.2 (Jelly Bean), It’s powered by 1GHz Dual-Core Qualcomm Snapdragon S4 processor along with 2000mAh battery. The Nokia XL comes with 5-inch IPS LCD screen, 768MB RAM and 5-megapixel rear & 2-megapixel front facing camera, with internal memory 4GB and expandable 32GB on MicroSD card. This smartphone is launched in starting week of April, 2014 in India. Nokia XL mobile are running on android open source project, and also get Skype, outlook, and onedrive facility. Nokia X-series provides facility of 1 month free worldwide calls on Skype. Nokia XL Powered by 1GHz dual-core processor. It has a powerful processor. It has Qualcomm Snapdragon™ S4chipset.It has 768 MB RAM With 4GB ROM and user can be expanded memory up to 32GB via SD Card. Nokia XL comes with 5.0-inch IPS LCD screen with 800 x 480 pixels Resolution. It has 5 MP Rear Camera with 2592х1944 pixels, and 2 MP Front facing camera. Nokia XL is a stylish phone. It has 141.4 x 77.7 x 10.9 mm, dimensions and phone weight is 190g. Nokia XL runs on android 4.1.2 Jelly Bean. The Smartphone has a compass, Accelerometer, proximity and Maps, Calendar, Google Search, Gmail, YouTube, Google Talk, Alarm, Calculator, Clock, and other Google sync apps. It has very popular apps like BBM, Plants vs. Zombies 2, Viber, Vine and Twitter come pre-installed.Nokia XL mobile are running on android open source project, and also get Skype, outlook, and one drive facility. Nokia X-series provides facility of 1 month free worldwide calls on Skype. 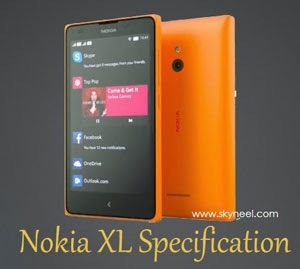 Nokia XL support 2G and 3G network and both SIM card slot support GSM SIM. Nokia XL has Wi-Fi, Bluetooth, GPRS and EGPRS or EDGE, with 2000mAh Li-ion battery. 2. Nokia XL has Decent Screen Size. 1. It doesn’t have Compass and Gyroscope. 2. Nokia XL doesn’t have a Front Camera. 3. Nokia XL has Heavy Weight.